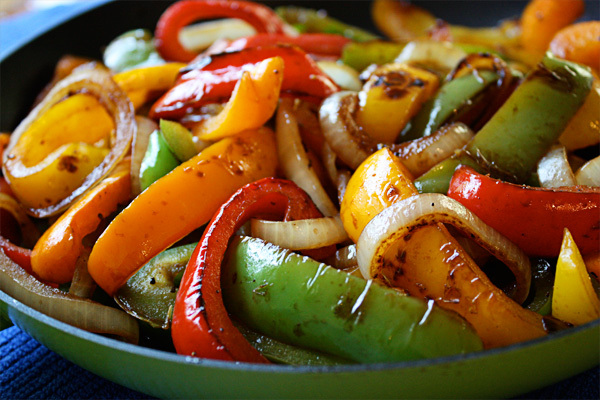 If I had to choose one vegetable side dish with the most health benefits, it would be balsamic peppers and onions. The vegetables with the deepest colors have the most antioxidants so you can imagine what this stunning combination can do for your health. It looks fancy but this is a simple, easy recipe that cooks in just ten minutes and oh, the fabulous taste. The first time I made it, I wanted to eat only these delicious peppers for my whole meal. In this quick and healthy recipe, I add just a pinch of sugar to enhance the sweetness of the peppers and if I could have found a sweet Vidalia onion, I would have used that, so if you can find a sweet onion, it would make this dish even better. You can even add a jalapeno if you like things hot. This easy recipe is the perfect side dish for chicken or fish, added to a pita sandwich, on top of a steak, or even part of a healthy breakfast. Here are just some of the reasons why you should try these green, red, orange, and yellow quick balsamic peppers: Brightly colored fruits and vegetables contain high amounts of vitamins, antioxidants and minerals, which keep the immune system strong. Green vegetables are high in vitamin C (good for bones, teeth, muscles, and skin), red vegetables are high in vitamin A (for eye health) and lycopene (supports prostate health), while yellow & orange ones are high in carotenoids (protect the heart, lungs, and eyes). Overall, these combined colored peppers may help protect against heart disease, cancer, memory loss, macular degeneration, and by boosting your immune system, might even help prevents colds and flu. Wait, there’s more. Onions have antibacterial properties, help the liver eliminate toxins, and may be better for your heart than red wine!